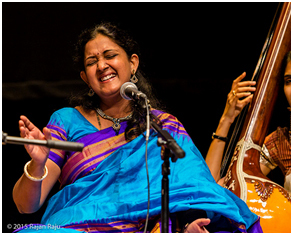 Manjiri Asnare-Kelkar was born into a family of music lovers in 1971, in Sangli – a small town in Western Maharashtra. Her father, Shri Anand Asnare, a well known tabla player and a recognized artist of AIR, initiated Manjiri into Indian Classical Music. She was also well-trained in Kathak alongside vocal music and had won awards for her excellence in the dance form in her early days. Despite being proficient in both music and dance, she found her true calling in music. Initially, she received lessons from Chintubuwa Mhaiskar of the Gwalior gharana, who was one of the finest gurus based in Sangli. Later, she went on to seek taleem from Madhusudan Kanetkar, a doyen of the Jaipur-Atrauli gharana and a disciple of Bhurji Khan. She has also been one of the disciples of the Kishori Amonkar. Manjiri continues to receive invaluable guidance from Padma Talwalkar. Recipient of the prestigious Kumar Gandharva Rashtriya Samman for 2013-2014, from the Government of Madhya Pradesh. Manjiri has been the first recipient of the Ustad Bismillah Khan Yuva Puraskar for 2006, conferred by the Sangeet Natak Akademi of India. Recipient of the Surashri Kesarbai Kerkar Scholarship, given by NCPA. L. Deshpande Foundation Award (1994). She received the scholarship for classical music for the period 1992-1993, from the Government of India. She was conferred the Hirabai Badodekar Smruti ‘Gaan Hira Puraskar’ by the SNDT University, Pune. She received the Sanskritik Puraskar from the Government of Maharashtra. She was awarded the Raza Puraskar by the Raza Foundation, New Delhi. She is an acclaimed ‘A’ grade artist of the All India Radio. Greatly inspired by Malini Rajurkar, a senior exponent of the Gwalior gharana, Manjiri has developed a command over Tappa, a popular semi-classical art form. She has been performing in prestigious music conferences all over the nation and abroad. She was conferred the title of ‘the Future Kesarbai Kerkar’ from none other than the late P. L. Deshpande, a great name in Marathi literature. Picture by Rajan Raju from http://www.flickriver.com/photos/tags/manjiri/interesting/.